JANSSONIUS -Lot of 5] World and Continents. JANSSONIUS,J. - Lot of 5] World and Continents. Lot of 5] World and Continents. - JANSSONIUS,J. Title : Lot of 5] World and Continents.. Size : 5.7 x 7.9 inches. / 14.5 x 20.0 cm. Description :A fine, matched set of world and continent maps. Jan Jansson engaged Abraham Goos, one of the most accomplished engravers of the day, to create these plates for his continuation of the Mercator pocket atlas. This beautiful set is illustrative of the fluctuating cartographic theories prevalent during this period of discovery. All with German text on the verso. 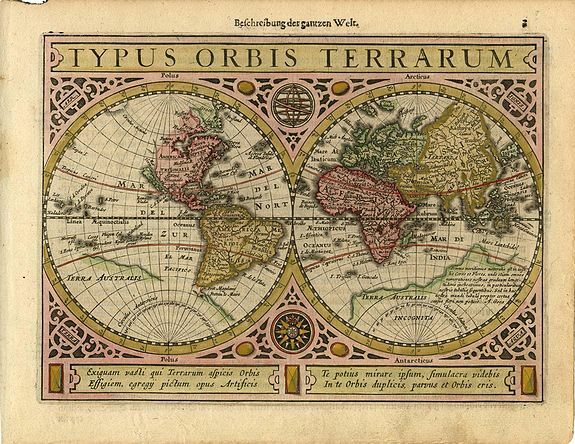 1) Typus Orbis Terrarum is a splendid double hemisphere world map. Though similar in style to its predecessor by Hondius, it now has California as an island with Terra Australis reduced to a faint, though still massive, shaded coastline. The map is embedded in a strapwork surround that is inset with a compass rose, a planisphere and the four elements. 2) Americae Descriptio shows the peninsular California and includes a curious delineation of the northwest coast of North America, which is separated from Asia by a narrow Fretum Anian with its coastline bisected by an unnamed strait leading to the Northwest Passage. The St. Lawrence River is shown flowing from a small lake in the West, and the Great Lakes are no where to be seen. There is an area of shading in Virginia alluding to the possibility of a Verrazzano type inland sea. 3) Asia, though engraved by Goos, strongly resembles Pieter van den Keere's configuration with Japan on the Teixeira model and the island of Korea, here called Cory. Van den Keere engraved many of the other maps in Jansson's Atlas Minor. 4) Africa Descriptio depicts typical 17th century cartography with the twin lake sources of the Nile, and the Lunae Montes, or Mountains of the Moon, just south of the lakes. 5) Europe Nova Tabula shows the discoveries of Willem Barents in his quest to find a Northeast Passage to Asia. Shirley nr.325. America, Burden nr.221. Africa, Betz nr.64. Asia, Yeo nr.21. Condition : In good condition, there are some small stains mainly in the margins.